Florida has its seasons, among them our own "peeper season" - our casual equivalent of Vermont's flocks of tourists with their car windows down, enjoying the many colors of fall. 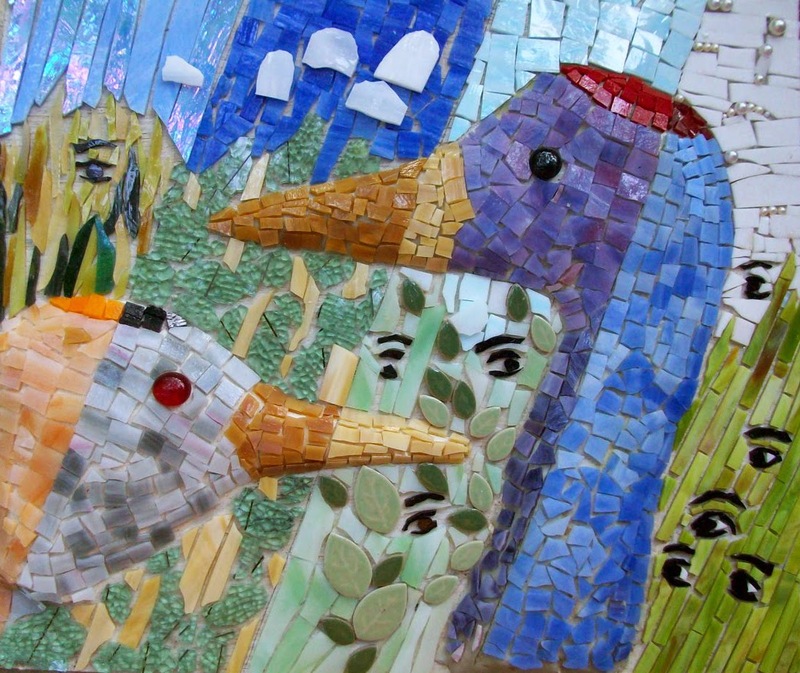 Our peepers are the tourists who flock to our shores in winter and spring to peep at our little peepers: specifically, in this mosaic, the sandhills that pop up here and there in the grasses of the celery fields and meadows where shallow lakes form. This mosaic began a couple of years ago, when my mosaic class was still meeting in the old portables at Suncoast Technical College, and I was playing around with various substances to show students how to make 3-D effects on a board. I used mortar, two types of clay, and a finely ground product similar to mortar that works like clay but dries hard as a rock and can be sanded and formed quite smoothly - perfect as a substrate for mosaics. I made parts of two crane heads with the four materials to show how they each could be worked, and how each dried. A few weeks later I cut up some blue glass and started laying it around one of the heads, just for fun - because who in the world would make a crane's head blue? And then the class got busy and I took home the board and forgot about the cranes. ... Until a few months ago, when I looked at it one day and it started looking back - not in a woo-woo sort of way, but in a hey-there-are-all-sorts-of-possibilities-here sort of way. So I set it up on my table and got to work. This image is the almost-finished mosaic, before grouting. I still have to grind smooth and adhere the clouds in the "summer" panel. I didn't decide to add all the eyes until I had worked out the four seasons (they go from right to left, starting with winter). I can't tell you why, but there they are.